In the many years that I have spent helping organisations improve their ways of working, one of the most common problems people have is the feeling of being completely overloaded with work, and the consequent anxiety about falling behind. In most cases, it is not just a feeling, people are genuinely overloaded with tasks that they cannot complete, and management does not seem to care. The immediate consequence is usually generalised frustration at all levels: many activities are behind schedule, and the queue of tasks seems to grow beyond the capacity of the organisation. Resentment (towards the company, managers, colleagues) for the excess of work, like any other feeling that pushes responsibilities towards somebody else, is pointless. We must start, as always, from ourselves and recognise the part we are playing to ensure the persistence of the vicious circle we are trapped within. Only then we will be able to lead change across the company and help others towards a healthier work environment. Here follow the top three mistakes that should be recognised for the real change to begin. Many believe that only those who take many tasks upon themselves are overcommitting, and they do not realise that by not rejecting any duties or failing to notify when some activity will fall behind, they are also overcommitting. The first step should always be making a realistic plan of the work ahead, and that will allow recognising what might not be carried out on time, or at all. In some cases, you might need some short meetings to collect details about some of the tasks, before you can schedule them. However, once you have your plan, share it with the rest of the people, the project sponsor, anybody that might be waiting for you to deliver: not knowing what to expect is the single most unsettling feeling that a manager can experience during a project. Remember that knowing ahead of time that you cannot complete a task is still better than not knowing when and what you will deliver. When reviewing your list of activities, be very honest with yourself and flag any task that you could transfer to somebody else. There are two main reasons to delegate a task. The first one is that it is more relevant to somebody else’s domain or to what they are already working on. The second reason is that the task is not very high on the list of priorities, and therefore can be passed onto somebody who might be less senior or proficient, but still able to carry it out. Many people struggle with delegating, fearing that somebody else might get credit for their hard work, or not trusting that the level of quality will be up to their own standards. However, learning how to delegate effectively is a crucial step in your professional growth. Empowering others will allow you to increase your throughput, build trust among the people who work with you and help others in their own journey towards improvement. One skill that everybody should master as soon as possible in his or her career is the ability to distinguish urgent tasks from important ones. Is there a hard date on it? Is it on the critical path of other activities? Do I have to do it immediately? Is the company going to benefit from it? Will it damage the company if not completed? Does it comply with the ultimate objective of the company? If the answer was yes to all three, then the task is most likely also very important. Most people are inclined to prioritise urgent over important because it feels more pressing, and probably because it is in many cases a quick win. However, having to continually run after urgent tasks will make you fall behind with your most important activities. There are few tools or techniques in my opinion that can improve productivity like the priority matrix does. The “Eisenhower Decision Matrix” (a.k.a. the “priority matrix”) owes its name to the 34th President of the United States, who widely used it during his entire career. I recommend that you make a clear list of tasks that are on your to-do and you start placing them in the quadrant to which they belong. Every day you can remove from the matrix what was completed (or even just planned) and add any new item that entered your to-do list. 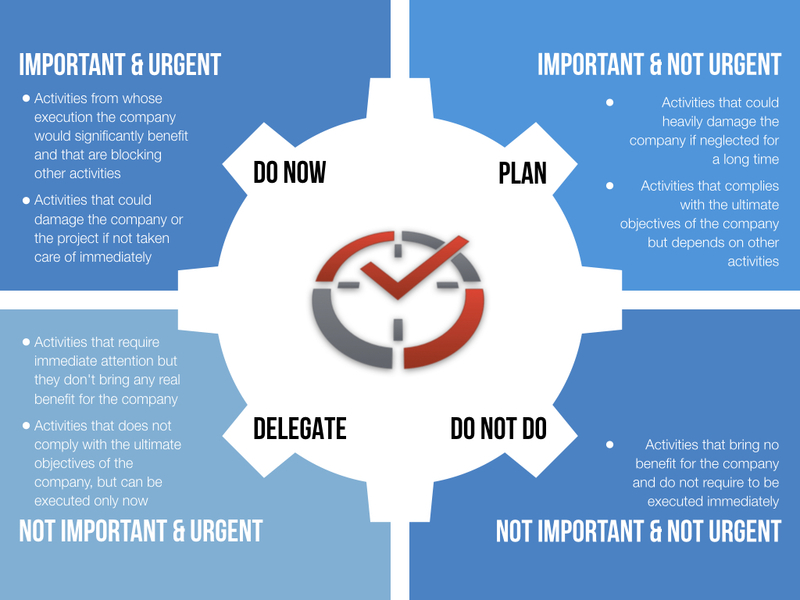 The priority matrix is an inexpensive way to understand what you can commit to delivering and identify tasks that need urgent attention, or you cannot carry forward. Once the matrix is definite, you can validate the output with your team or manager. Are you already using the matrix? Or, do you use any other technique? I would be glad to read from you and know your experience: you can log a comment below, and we can have a chat about what works for you.